Palm Sunday 2012 - April 1, 2012 - NO JOKE, You've won the lottery! It's the beginning of Holy Week and the beginning of April - Can we find salvation within and without? Challenging the revolution within and without. 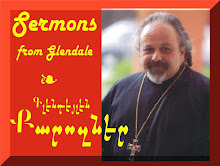 Delivered and recorded LIVE at the St. Peter Armenian Church & Youth Ministries' Center, Glendale, CA.